Every year, companies spend millions of dollars running business promotion competitions to improve new customer acquisition rates. While many of these competitions are successful on the face of it, just as many could easily provide greater returns. By changing your perception of competitions from being a tactical way to boost short term sales to a powerful tool in your customer strategy, you can reap large returns. What is a business competition? Business promotion competitions are called many different things, but they all have the same attributes. The cost of entry is either free, nominal, or included in the purchase price of the product. Prizes can be awarded on a random or judged basis with different types of competitions requiring different licenses. If you want to expand your use of competitions, start by using a customer value approach to planning and implementing them. The underlying basis of the customer value approach involves focusing on nurturing and building relationships with the right customers, resulting in a long term, mutually beneficial outcome for you and the customer. This contributes to significantly increasing company profitability by acquiring and retaining the right customers for the business. Most of us know about the tactical, short term use of competitions, but what are some of the strategic advantages of running a customer value competition? Most competition entrants are aware that part of the implicit agreement for entering a competition is providing some information about themselves. What’s more, people entering a competition will provide accurate and legible information on the entry form so that you can contact them if they win the prize. This makes competitions the perfect opportunity to do a little customer data gathering. The information collected could be as simple as a name and address, improving your understanding of customer geographic profiles. However, just by adding a couple of additional questions focused on, say, customer’s changing needs, you can greatly increase the depth of customer information collected. Analysis of this information can reveal a goldmine of customer trends, which are expensive to collect through other traditional market research methods. It always amazes me that some organisations will throw away this valuable customer information, and then pay a market research firm to collect it all over again. Competitions can also be a subtle way of contacting existing customers to stop them from leaving at a likely chum trigger point. For example, when a competitor launches a new product, competitions can be used to reinforce your product’s benefits and dissuade your customers from sampling the competitive item. Competitions can also be used to encourage customer behaviour that reduces churn, such as encouraging customers to use automatic direct debit payment methods. Through targeted competition questions, active sales opportunities can be identified. For instance, a hardware company could ask existing customers, ‘Are you renovating or building a home?” Customers answering “yes” are likely to be shopping around for building products. Now you have recognised a genuine customer need and a means to contact them all the requirements for a nice, targeted, direct campaign. This approach can often be faster and cheaper than performing a mountain of data analysis on spending patterns. Over time, your products improve and customers can forget why they bought from you in the first place. Having them enter a competition that incorporates the product benefits as the competition entry answer reminds the customer of benefits they may have forgotten or never knew about. I’ve seen this type of competition generate an immediate increase in sales to existing customers, and it stands a far greater chance of success than just sending out a new brochure by itself. 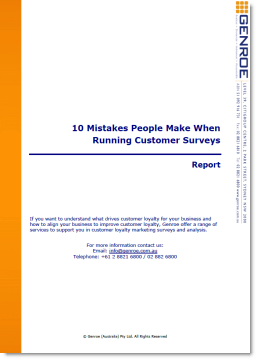 We all know that it costs far more to acquire a new customer than to retain an existing one. Yet, many companies still penalise their current customers for giving them ongoing business while rewarding newly acquired customers. Running regular competitions for existing customers rewards them for their ongoing relationship with you and they don’t get irate when they see your company running acquisition focused campaigns. Don’t let that stop you from thinking a little laterally about competitions, especially the next time you’re looking at your marketing strategy and wondering how to improve you customer acquisition or retention performance.